don't. Multiply that number by 1%. You'll owe the greater. provided to help offset the costs of insurance under the ACA. UNLIKE EMPLOYER SPONSORED TAX FREE HEALTH INSURANCE. THIS STIPEND AS INCOME ON YOUR W-2! annual income. In 2016 the penalty jumps to $695 per person or 2.5% of income. Beyond 2016, the fines will be indexed to the cost of living. requested payment was subject to the sequester reduction and the amount. 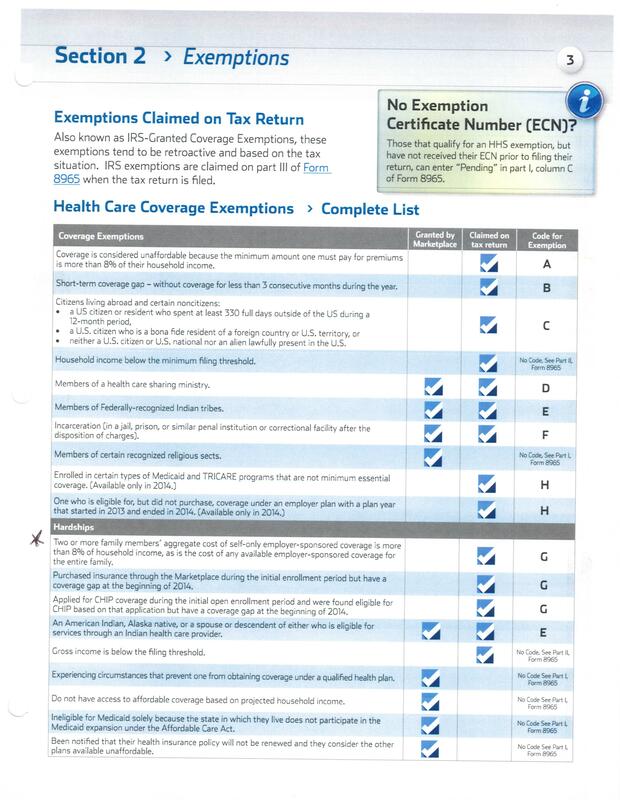 Affordable Care Act, please see our questions and answers. policy, see our frequently asked questions. the value of their health care benefits. additional information on the Additional Medicare Tax, see our questions and answers. premium tax credit and application of the employer shared responsibility payment. information, please see Notice 2013-45.
plans, government agencies and certain other parties that provide health coverage. announced transition relief for 2014 from this annual information reporting. information reporting provisions for 2014. For more information, please see Notice 2013-45.
additional information on the final regulations, see our questions and answers. the Small Business Health Care Tax Credit for Small Employers. notice for all prior periods. the Affordable Care Act to HRAs. rules relating to excepted benefits. Health Savings Accounts (HSAs), and Archer Medical Savings Accounts (Archer MSAs). are met. For more information, see news release IR-2010-128 and Notice 2011-5.
for purposes of high deductible health plans associated with HSAs. the news release issued by the U.S. Department of the Treasury. Act’s market reforms to certain health FSAs. spouses. For additional information, see our questions and answers. afford health insurance coverage purchased through an Affordable Insurance Exchange. IRS. For more information on the credit, see our questions and answers. by reading our news release or this notice. A 10-percent excise tax on indoor UV tanning services went into effect on July 1, 2010.
the participation of tax-exempt organizations in non-MSSP activities through ACOs. organizations that may wish to participate. certified as eligible for the credit or grant. IRS guidance describes the application process. awarded or the tax credit the applicant was eligible to take. by law. Listings of results are available by state. Learn more by reading the IRS news release, the news release issued by the U.S.
Department of the Treasury, the page on the HHS website and our questions and answers. The Affordable Care Act establishes a number of new requirements for group health plans. limitation. The proposed regulations solicit public comments to be submitted to DOL. Departments of Health and Human Services and Labor and in additional guidance. incurred for an individual health insurance policy. providing health insurance for United States health risks. of organizations applying for recognition of exemption under 501(c)(29). taxable. This payment is not made by the IRS. More information can be found at www. which certain failures to meet the requirements of section 501(r) will be excused. Notice 2011-92 and Notice 2012-74.
in 2012 and the first taxable year beginning after Dec. 31, 2012.
purposes of section 833 is computed. 1, 2013, the Treasury Department and IRS issued proposed regulations on this provision. Comments may be submitted electronically, by mail, or hand delivered to the IRS. The IRS and the Department of the Treasury have issued final regulations on this fee. to provide for the reporting and payment of the PCORI fee. and answers for more information. Act of 2010: News Releases, Multimedia and Legal Guidance page. families. The IRS will administer the tax provisions included in the law. individuals and families with low to moderate incomes. Learn more. monthly premium. Learn more at HealthCare.gov. Health Insurance Marketplace. Learn more at HealthCare.gov. identified by Code DD on your Form W-2 is not taxable. those 65 and older for tax years 2013 through 2016. Saving Accounts, and Net Investment Income Tax. reconcile the payments on your 2014 tax return filed in 2015. Learn More. coverage throughout 2014. Learn More. report changes such as income or family size to your marketplace.